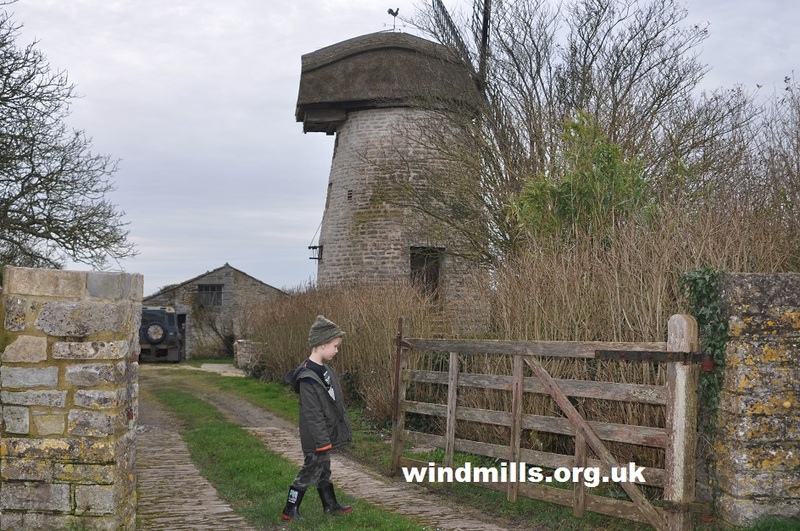 Stembridge Mill on the edge of the village of High Ham, near Langport, Somerset, in south-west England, is an example of a type of windmill known as a Tower Mill. Such mills consist of a brick or stone tower, on top of which sits a roof or cap which can be turned to bring the sails into the wind. The advantage of the tower mill over the earlier post mill is that it is not necessary to turn the whole mill with all its machinery into the wind; this allows more space for the machinery as well as for storage. Stembridge windmill was built in 1822, including in its construction parts from the earlier Ham Mill which stood nearby. This most attractive of tower mills has a 26 feet (7.9 metre) high tower and sits on a mill mound, which when in use would have prevented people and livestock from wandering too near the turning sails. It is the last survivor of five windmills that once existed in the area. The mill ground small quantities of corn grain for local use. It worked by wind until it was damaged by storms in 1897, after which the mechanism was modified and a steam engine installed outside the tower to power the mill. Stembridge Mill was last used commercially in 1910 and nothing was done to the mill for many years. However, in 1969, the owner, Professor H. H. Bellot, left the windmill, cottage, garden, orchard, and adjoining field to the National Trust in his will. It was restored by them between 1970 and 1975 and then again in 2009. The mill consists of four floors, a thatched cap, and is constructed of local limestone known in the area as Blue Lias. The remains of an old bakehouse can still be see to the rear of the mill. Stembridge Tower Mill is now the last remaining thatched windmill in England. The mill is designated as a grade II listed building. It is owned by The National Trust and underwent a £100,000 restoration by local craftsmen funded by the Grantscape Community Heritage Fund in 2009 and was re-opened later in the year. The mill is open to the public on the first and third Sunday of each month between March and September. 1pm to 4pm. OS Grid Reference: ST432305 / OS Sheet - 182. Visitor note: The mill is in the grounds of a private home and public access is limited to the NT’s advertised opening hours. Car parking space is limited and there are no public toilets or similar facilities. Stembridge Tower Mill near Langport in Somerset. See a photograph taken in 1965 of the windmill before it was owned by the National Trust. More information on visiting High Ham and a map of the location of Stembridge Mill. See also our separate page of images of Stembridge Windmill in High Ham.